Speaking to BBC Radio Leicester, Steve Score, Socialist Party member and co-chair of Save Our NHS Leicestershire, explained why the lobby was taking place: "We are worried that the removal of the intensive care beds from the General Hospital will pre-empt the potential closure of this hospital as an acute hospital. "What we need is a public consultation and we are seeking the support of the committee for the idea of a public consultation on these proposals. If they refer it to a body that can make decisions, then all the good. We want to raise it everywhere we can." Chair of the committee, Councillor Elly Cutkelvin, said it was "quite understandable" that the public were concerned about the lack of consultation and that the committee would recommend that this matter is referred to the body that has a duty to examine the proposals. This referral is a necessary first step and marks the achievement of our first campaign objective. The next is to secure formal consultation of the public. 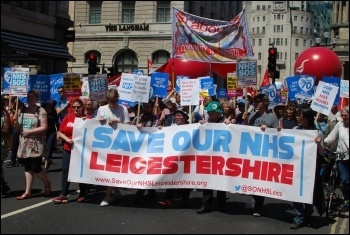 The lobby coincided with the publication of a significant report by De Montfort University's Health Policy Research Unit, which outlined a number of critical problems with the proposed changes being made by University Hospitals Leicester (UHL) - the body which runs Leicester's hospitals - to acute services at the General. One of the authors of the report, Dr Janet Underwood, pointed to a lack of transparency in UHL's current plans: "Probably one of our biggest concerns is the fact that a lot of the detail is in the appendices - not in the public domain - which stops us from evaluating, fully, the plans." This is despite the fact that works are set to commence in October 2018! The report demonstrates how the removal of the intensive care unit is a part of UHL's wider strategy of "moving from three acute hospital sites to two." If UHL is successful in removing the unit, it would effectively make the closure of the General as an acute hospital a done-deal when they come to consult on it some time in the near future.